Ooh, ooh, ooh I've been so excited to share this project! 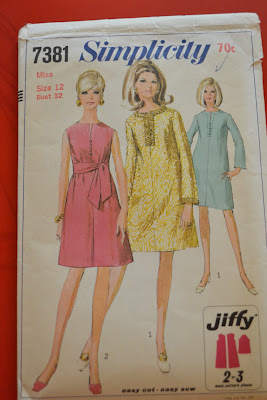 The very lovely vintage Simplicity 7381 (dated 1967), View 2 dress. I teased about it here and seriously it wasn't to build the excitement. I finished this dress a month or more ago, but we had raining horrid weather for weeks which put paid to any photo shoots. When the sun finally came out to play I was laid up in bed with a tummy bug, but in the name of duty I dragged myself out and into this dress and tried a shoot - the resulting shots were less than stellar. But today we had a lovely early evening light going on, after a perfectly warm, autumn blue sky day. Sigh. So I dragged that dress on happily, got M and her bike (had to keep her occupied), and thrust the camera at darling P for a quick re-shoot. I love her! Fabric-wise I was kind of channeling Jorth's Graffiti dress. I know, I know not quite the same colour etc. But I wanted that feeling of a piece of cloth that had been streaked with paint randomly, wantonly, breathtakingly brightly. I found this perfect (in my opinion) lighter weight cotton sateen at a little local fabric shop. It was a dream to work with and feels lovely to wear. But those who have read my previous posts know I am a bit obsessed with fond of cotton sateen. I actually thought it was rayon when I first caressed it as it seemed so light and drapey, so imagine my joy when it turned out to be cotton sateen. I love the sash belt. I thought it would slip and not stay snug around the waist, but the whole sash is interfaced so it actually holds its shape and snugness surprisingly well, and whilst a minor adjustment might be needed from time to time it's nothing major. In terms of construction, I made a few diversions from the instructions. The changes were minor and simply done as they made more sense to me. If you'd like the details you can check out my pattern review here. As per normal, whilst this was a size 12 pattern and that's usually a good fit for me at the hip and a bit too big at the waist, I found it was hugely sack-like with oodles of ease in a non-flattering way all over. I ended up taking literally inches out of the bust and waist and a couple more off at the hip, taking it in straight down the side seams. I really need to learn to adjust by doing something other than just that. To be honest, it probably would have been better spreading those taken-in inches over the side seams and centre front and back seams as well. I'm wondering if the bust darts are actually sitting where they should...? And next time I'd narrow up the shoulders as well, you can see they are extending past the shoulder a little.